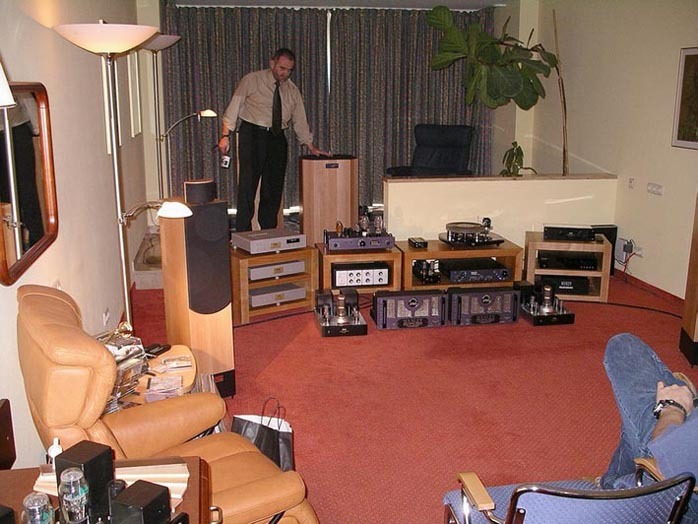 WLM designer Martin Schützenauer's listening room is shown to the right, the photo deliberately rotated to retain the panorama vision in full width which our site format otherwise doesn't allow for. You'll note the odd-looking rear channels. Fed from Martin's all-analog 4-channel circuitry, those bird houses are the original prototypes. 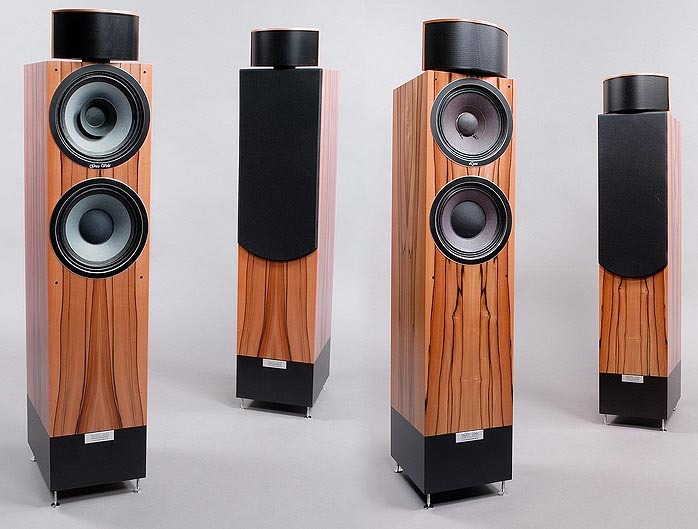 They sold then-retailer Hannes Frick on Schützenauer's PAC treble system and voicing and would lead to the eventual formation of WLM. 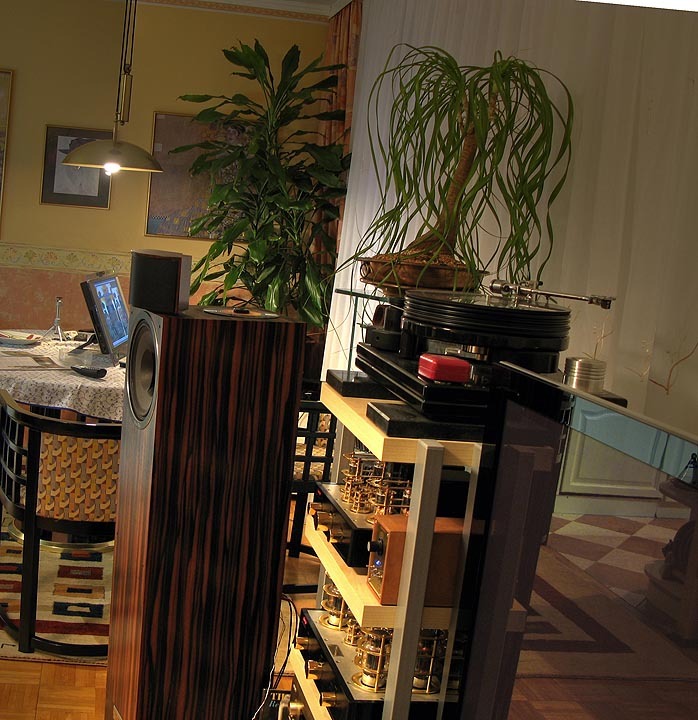 Schützenauer's credo back then already was fully active - plus dedicated bass systems. "Stooping low" to embrace passive filter networks came later when business-savvy Hannes Frick insisted on an upgrade path in stages. 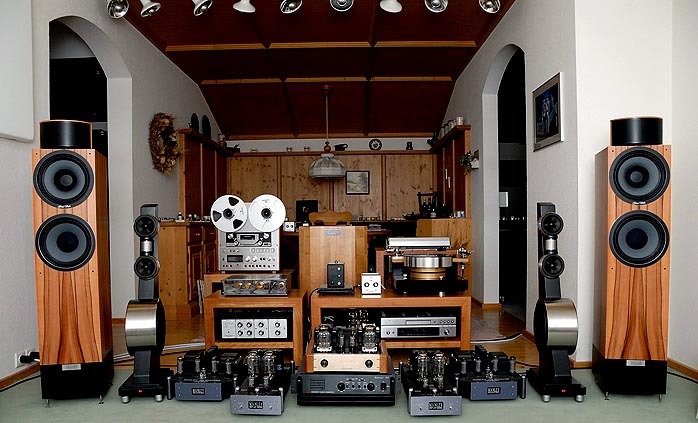 As well, Frick knew that valve clients with expensive stereo amps in particular were clamoring for passive solutions. Make no mistake though - the designer's heart lies with the active concept. The passive provisions, to his mind, are compromises. They should eventually lead to active filtering with its attendant bi- or tri-amping. WLM's formal company launch occurred at Vienna's KlangBilder Show 2003 with the Aura monitor and Viola floorstander in exclusively active mode. 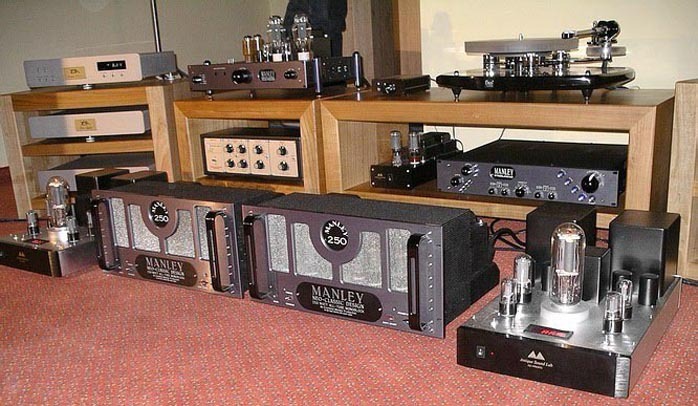 The Viola was shown with a Duo 15 on the System Control V and with Manley and Antique Sound Lab valve gear, leading to a Best of Show win as voted by the event's visitors. This success created dealer inquiries for a flagship model. The Grand Viola concept was birthed, using the original PAC system coupled to an Eminence Kappa Pro 10-incher with cast aluminum basket. A parallel development launched the Lyra, a Viola in passive guise with 8" driver. That prototype suffered from anorexia, i.e. lack of body. Enter its passive radiator. An expensive SEAS unit and an Asia-sourced car audio driver were tested, with the SEAS shredded to pieces after a 5-minute test run. The mobile audio diaphragm proved indestructible. Using his personal pair of Tannoy Turnberrys, Frick concluded that the growing Lyra already outperformed it spatially and with more nuance though still lacked its fundamental weight and chestiness on low male voices. Schützenauer responded to Frick's ongoing demands not with the finger but a 50mm drill bit, right through the base of the then-sealed cabinet. Bingo. One hole led to more holes and eventual perfection was proclaimed with a single 110mm diameter vent. This led to WLM's current adjustable pipe-within-a-pipe port and shifted the previously sealed boxes of the entire line to ported alignments. The end result? The Lyra, to date, is the best-selling model in the WLM range. 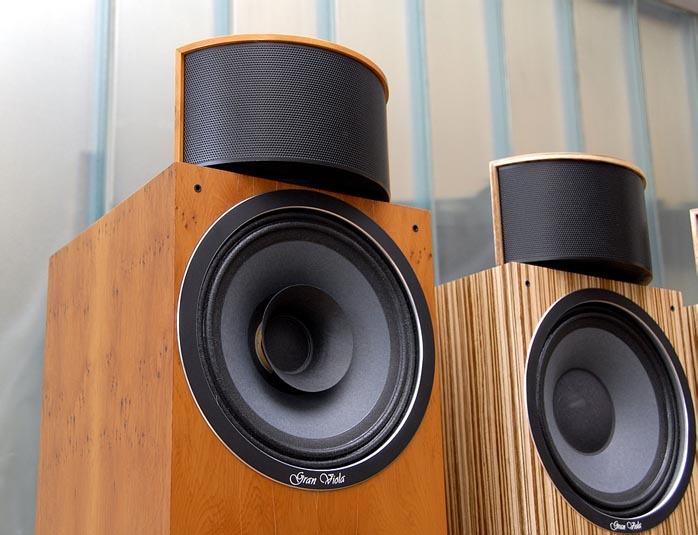 2006 saw the addition of the Diva Series which, already in prototype II guise, reportedly had beta-testing dealers in attendance call the Tannoy "castrated by comparison". So much for model genesis. 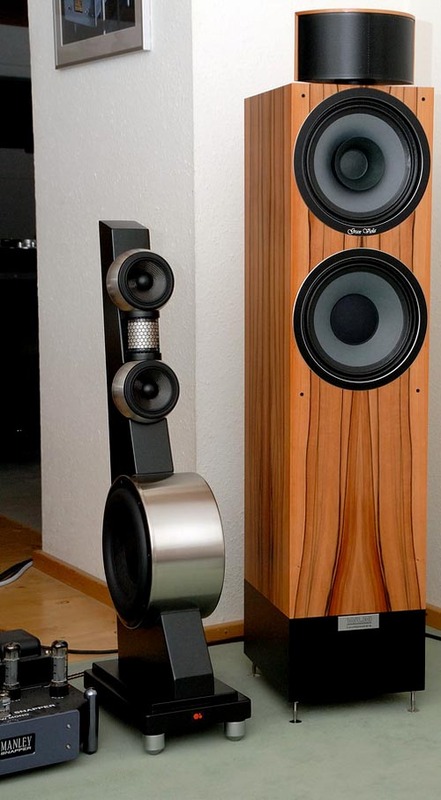 Not one to suffer self delusion lightly, Hannes had meanwhile acquired a pair of Gallo Acoustics Reference 3.1s to use as a comparative and universally acknowledged reference in its price class and beyond. As the photos show, the recent MkII iteration of the Grand Viola has grown by one 10-inch driver. It now mimics the Lyra's passive radiator array. This development, we'll assume, was in response to the GV's flagship status in the WLM line and the consequent necessity for truly impressive bass response even in fully passive mode. It now also differentiates to a more profound extent between the floorstanding and monitor Grand Viola models. More surprising to some, perhaps, will be the sighting of the new wideband driver, looking for all intents and purposes like a Zu - minus the aluminum phase plug. That's because it is the same driver on which the Zu is based - an Eminence Legend model, more confirmation that my prior characterization of WLM as the "Austrian Zu" (or now Zu as the American WLM) was quite fitting indeed. 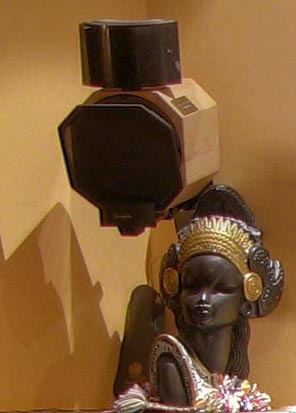 bass anchor for the Diva range speaker models which dealers and customers had been clamoring for. The Duo designation continues with WLM's established up/down-firing subwoofer geometry of vertically opposed drivers for higher system sensitivity, greater accuracy (less excursion for equivalent SPLs) and mechanical resonance cancellation. To achieve the Basic Duo's lower target price, I assumed the octagonal enclosure of the larger Duos had been simplified to a column with a square footprint. 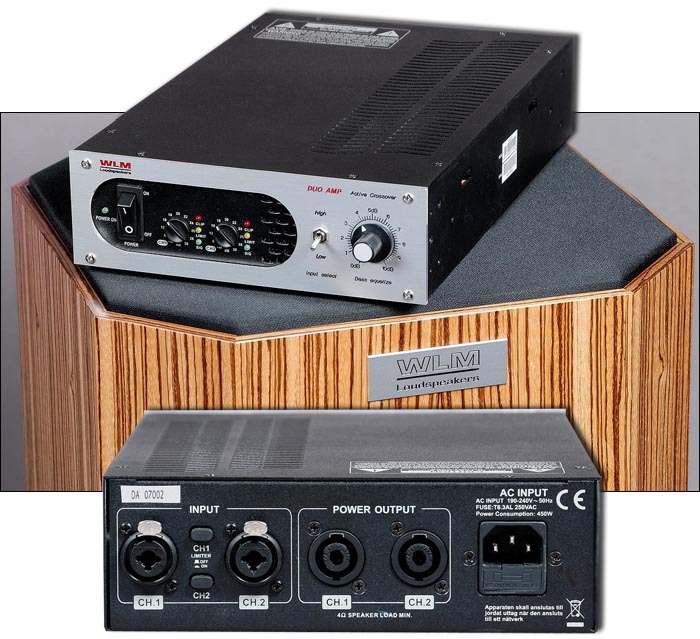 Would the amp still be an outboard affair or now find itself conventionally integrated in the enclosure? Not that "conventional" and WLM really go together. Replied Hannes Frick in a single e-mail to all my questions: "The new Grand Viola Signature MkII presently performs at such an exalted niveau in my studio as no loudspeaker has ever achieved here before. And so far I've only played her purely passive, without any correction, over the Almarro A318B integrated (a fantastic machine by the way). That combo is a musical dream. I'd rather not tear everything apart for Munich - but, duty calls and passion must yield for once." "Time and again, we as manufacturer have had to accept the sad fact that many of our dealers would sell our products without the specially developed compensation solutions. This short-circuits our development process and overall philosophy which relies on hard-hung drivers. Those cannot plumb ultimate depths without gain compensation. People who neglect that fact really shouldn't complain about lacking bass and its concomitant leaner presentation. "That's why our original Lyra was equipped with the auxiliary 8" passive resonator - to extend its bass performance. In the spring of 2007 however, the supplier of our 8" passive driver informed us that production of this part had been discontinued. There's no global demand for such a part. Even competing manufacturers no longer had anything usable for our purposes in their catalogues. This forced us to revisit the Lyra. A conventional 3-way with soft-suspended high-end drivers sans high efficiencies and compromised output, precision, control and agility it was clearly not going to be though. "Multiple iterations then eventually ended up with a 2.5-way circuit and completely new crossover as the ideal solution. 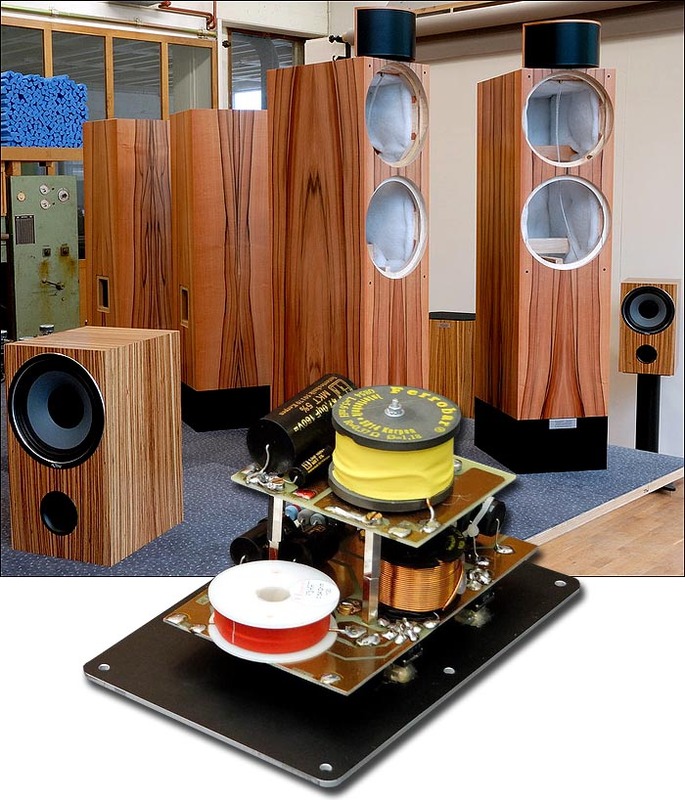 This created a loudspeakers which even without active compensation truly does perform at the highest level. In fact, the results were so persuasive that our prior reference model, the Grand Viola Signature we were going to send you for review, saw itself categorically dethroned by our new €6,800 Lyra MkII. 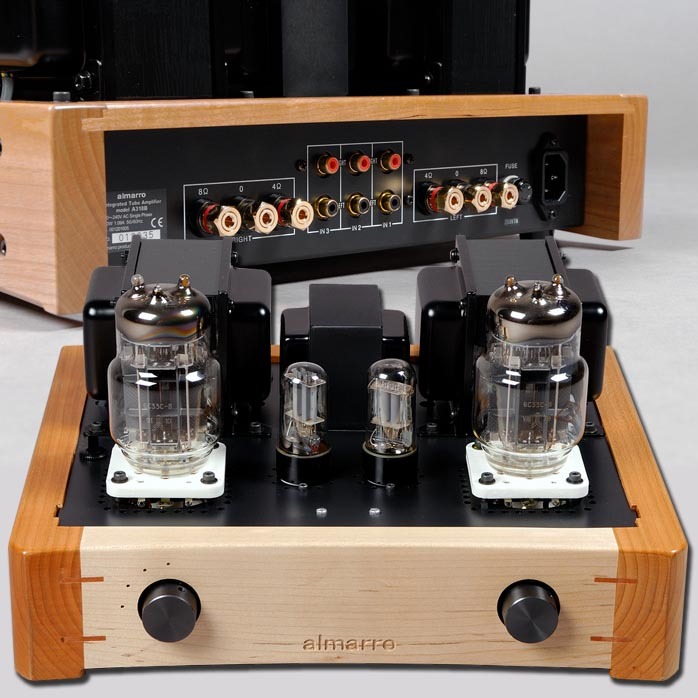 Hence a reworking of the Grand Viola Signature was next and its musicality, dynamics and spatial recreation driven by a superior tube amp are now truly a thing of rare beauty. Its lower passive woofer covers 30 - 200Hz. The upper widebander covers 30Hz to 4kHz, with the crossover transition to the Super PAC at 800Hz. The addition of the second woofer adds 5-6dB of gain in the bass region to significantly impact the overall tonal balance. These MkII improvements affected the final retail by merely €700/pr. "The new Basic Duo duplicates the shape and dimensions of the Duo 12 exactly. 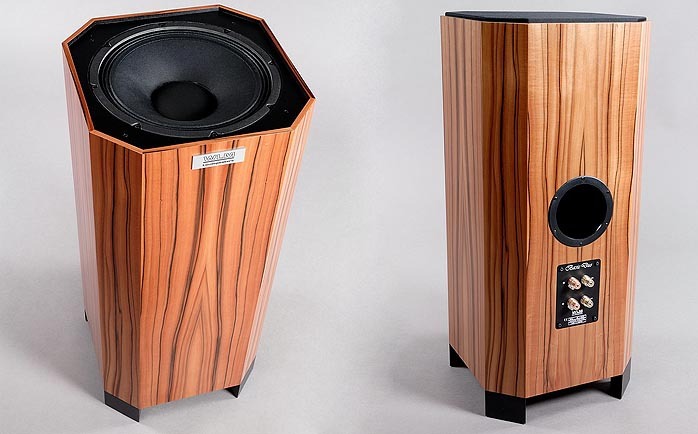 We drove the Duo 12's price down by €1,210 with black footers that aren't solid extensions of the octagonal cabinet and using MDF rather than Birch Ply. Still, the hardwood cross braces have been retained. We also went with a more cost-effective Eminence woofer but added a rear-firing reflex port which increased output by such a surprising amount that we'll incorporate it into the entire Duo range now. The new WLM Duo amp will be our stock offering for all our subs which, with now twinned pairs of binding posts, will have each driver powered discretely from one 480-watt amp channel each. For the €2,390 Basic Duo, the new €1,290 bass amp includes the Bass Control, albeit with a fixed 80Hz low-pass." 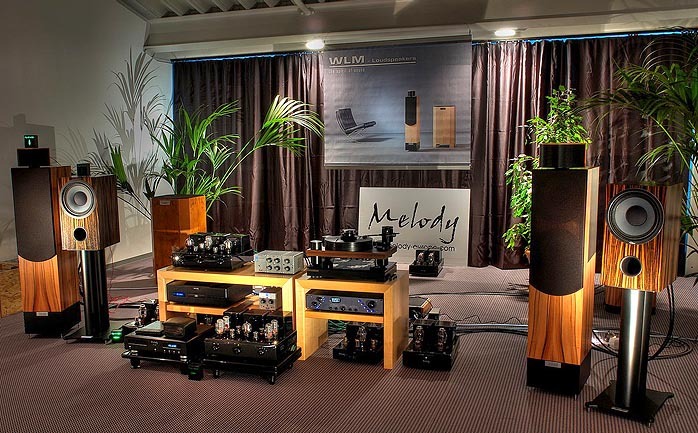 At the conclusion of the Munich HiFi show [WLM/Melody setup below], Marja and Henk opined in their show report that "the new WLMs were a revelation".